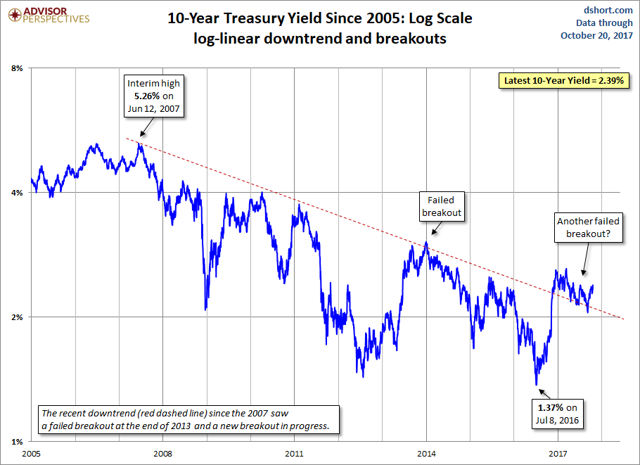 The key question for me is around the trend … is this a cyclical or structural downward trend in rates. The folks who forecast materially higher rates assume that the trend is cyclical. For me, and others, this is a structural trend and will not via business cycles change reverse. The structural difference is driven by automation, labor force worldwide, and the soverign debt carried worldwide. I do not have the perview nor the tools to articulate exactly what the range bands will be, but i just cannot see the overall trend reversing. That first group of folks, sic ‘the cyclicals’, are also the cheerleaders behind an upcoming certain US tax cut to help fuel the trend reveresal. I am just skeptical and do not see even a perfect tax reform tip the balance vs worldwide demographics and debt. It also seems that the answer to the question will be known by EOY ’18.